Approved by the Legislature and organized by Governor William Spry in 1909, the Capitol Commission directed the design and construction of the Capitol. 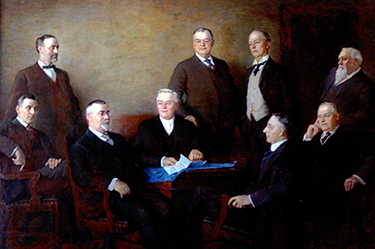 In recognition of the Commission’s work, the 1915 Utah Legislature directed John Willard Clawson to “paint a portraiture of the members […] for the sum of $7,500.” Clawson, a Utah artist of considerable international reputation, was nearly 60-years old at the time. The painting, Portrait Group of State Capitol Commission, shows the commissioners at nearly life size.